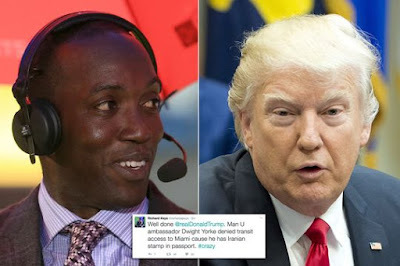 Former Manchester United striker Dwight Yorke was "made to feel like a criminal" as he was denied entry to the United States on Friday. Yorke said he was prevented from entering the USA due to an Iranian stamp on his passport having represented the 'World Stars' in a charity match against 'Iranian Stars' in Tehran in 2015. The 45-year-old enjoyed widespread success in English football, playing for Aston Villa, United, Blackburn, Birmingham and Sunderland before retiring in 2009. Yorke has enjoyed a varied career since then and, having this week worked for beIN Sports, was due to travel from Doha, Qatar to Trinidad and Tobago, via Miami, on personal business on Friday. "I couldn't quite believe what was happening" Yorke said. "I had bought my ticket and checked in and was about to get on the flight when I was stopped by two officials. I thought 'what is happening here? '.